Leawo Video Converter is remarked as a high definition video converter designed to convert common and HD videos to many popular formats like AVCHD to AVI, MOD to AVI, MTS to AVI, MTS to MOV, M2TS to AVI, M2TS to MKV, M2TS to MP4, etc with zero quality loss. The output videos play well on various portable devices such as iPod, iPod Touch 4, iPhone, iPhone 4, iPad, iPad 2, Apple TV, Apple TV 2, PSP, PS3, Mobile Phones, Android Mobile, etc. Embraced with professional HD video editing features as well as advanced video parameter settings, it allows you to trim or crop HD video, add watermark, add video effect and change conversion settings like video bit rate, frame rate, audio channel, etc. to get better outputs. With excellent 2D to 3D conversion ability, it will easily convert any 2D HD video to vivid 3D files with ultrafast speed for true theater entertainment at home. Supports to convert any source of videos among formats: AVI, DivX, Xvid, VOB, MOV, WMV, ASF, RMVB, RM, MPEG, FLV, MPG, MP4, MP3, WMA, 3GP, MKV, and so on. You can take any home-made videos, online downloaded movies and more into use. The converted video files are designed to meet with your specific needs. You can enjoy videos on portable media players including iPod, iPhone, iPhone 4, iPhone 4S, iPad, Apple TV, PSP, PS3, Zune, Xbox 360, BlackBerry, iRiver, MP4, MP3, Mobile Phones, Android Mobile, 3D TVs and more 3D display devices, etc. It is safe and clean. Video Formats: 3GP, 3G2, ASF, AVI, DV, DVD MPEG2, FFM, FLV, GIF, MOV, MP4, MPEG1, MPEG2 PS, MPEG2 TS, NUT, PSP, RAW YUV, RM, SVCD MPEG2, SWF, VCD MPEG1, VOB, YUV4MPEG, M1V, M2V, M4V. Video Codecs: BMP, DV Video, FFV1, FFV HUFF, FlashSV, FLV, GIF, H261, H263, H263+, HuffYUV, JPEGLS, Theora, XviD, LJPEG, MJPEG, MPEG1 Video, MPEG2 Video, MPEG4, MS MPEG4, MS MPEG4 V1, MS MPEG4 V2, PAM, PBM, PGM, PGM YUV, PNG, PPM, RAW Video, Real Video 10, Real Video 20, SGI, SNOW, SVQ1 Sorenson Video, Targa, TIFF, VP6, WMV1, WMV2, ZLIB, ZMBV. Audio Codecs: AC3, ADPCM IMA WAV, ADPCM MS, ADPCM SWF, ADPCM YAMAHA, FLAC, G726, AMR NB, AMR WB, AAC, GSM, GSM MS, MP3, MP2, PCM ALAW, PCM MULAW, PCM 8/16/24/32 bit, SONIC, SONICLS, VORBIS, WMA V1, WMA V2. Automatic Mode - the program shows carefully filtered list of supported parameters and codecs for each video/audio format. It is used by default. Manual Mode - the program shows the list of all available parameters and codecs for each video/audio format. You can enable this mode by choosing the "Show all" option. Oxelon Media Converter is one of the few video/audio encoding tools that can use four threads to take advantage of quad-core multi-processor systems. The great news is that you can adjust maximal amount of threads in the Settings. So, it is possible to take advantage of high-speed multi-conversion even on an eight-core system (and more). Seamless integration with Explorer allows you to keep working with files as usual. 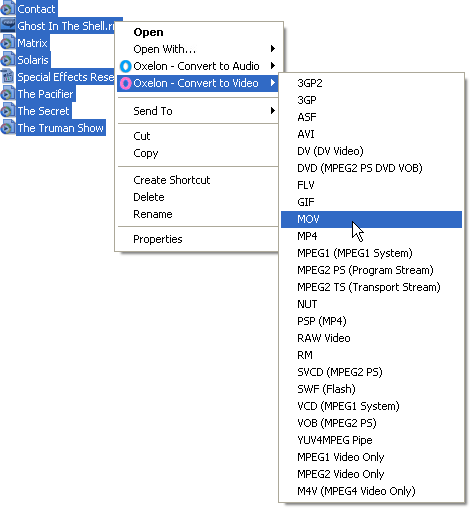 You can right-click on the selected files, choose "Oxelon - Convert to Video" or "Oxelon - Convert to Audio" from the menu, and select the media format. In this way you can quickly launch Oxelon Media Converter with the specified files and with the defined destination format. After that, you just click "Conversion" and the process is started! As you can see, Oxelon Media Converter allows to convert many video/audio files with just 3 clicks. After you add files into the list, you can click on each row using the right mouse button to see additional information about media files, such as codecs, frame rate, resolution, audio bitrate, audio frequency etc. If the conversion process fails with the "Error" status, then it is possible to get full description of the error in the same way -- by clicking on the file using the right mouse button. There's another convenient functionality: you can start playback of any media file straight from the list using associated external media player -- just double-click on any file using the left mouse button to launch media player, which will automatically load and play audio/video file. If media file is already converted (with the status "Completed"), then by double-clicking on the same row you can launch the converted copy of the file in the external player (it is useful for checking the quality of the converted audio/video files). Digital video and audio usually require large amount of hard drive space. Depending on the bitrate, video frame resolution, the amount of required space can vary greatly. Bitrate is a measure of the rate of information content in a video or audio stream. It is quantified using the bit per second (bit/s or bps) unit or kilobits per second (kbit/s). A higher bit rate allows better video/audio quality, but requires more hard disk space. Width and Height, separated by the "x" letter. Remember: width/height must be a multiple of 4. So, you can use Oxelon Media Converter to prepare your video files for uploading to YouTube. For this purpose, convert files to AVI format (using XviD for video, MP3 for audio, and set the Width/Height to "320x240"). If you want to quickly make available a small video file for watching in the Internet Explorer directly from your website, then convert it to SWF format -- choose minimal bitrates, adjust Width x Height to minimize the size, and then upload the converted SWF file to your web server. Now, you can give a link with the .swf file to your friends or post it on the Internet forums. Another approach (more advanced) is to convert video file to FLV format and to use some free flash-based media player with nice controls to play the FLV file within your web pages. It is possible to create animated avatar for the web forums, by converting a short video file into GIF using minimal Width and Height. Video file size can also be reduced by decreasing the frame rate: from 25 FPS (Frames Per Second) to 15, 10 etc. Audio: to reduce the size of audio file you must decrease audio bitrate. Audio bitrate defines how many bits of space the file takes per second of audio. Obviously the higher the bit rate, the higher quality audio you'll have. Sampling rate defines the number of samples per second taken from a continuous signal to make a discrete signal. It can be measured in hertz (Hz). Sampling rate usually does not affect file size in the compressed format. By decreasing audio bitrate you can prepare compact Internet audio podcasts (available even for dialup users). Also, sometimes it is a good idea to use Mono instead of Stereo in order to reduce the size of audio file. Sometimes, it is necessary to convert media file from one format to another (or to the same format) without changing video or audio stream. If you choose "Direct Stream Copy" from the drop-down list of Video Codec or Audio Codec, then conversion will be very quick, because that involves no re-encoding, just saving into a different format. "Direct Stream Copy" means no encoding at all -- to use the video or audio, or both as is, without conversion. In this way, audio codec can be changed inside the video file without video recompression, or vice-versa -- video can be recompressed, resized, and video codec changed, but audio stream and its quality can remain exactly the same. 1. Add video file. Right-click on the video file to get information about audio stream format. 2. Select the same media format (for example, MP3, MP2, etc.). 3. Choose 'Direct Stream Copy' as Audio Codec. Click Conversion. You can also recompress audio stream, and save it into another format. Actually, you have a full freedom to choose any media format you want. (2) it scans internal structure of each media file and determines whether it is suitable for decoding. If the file is supported, then program shows "Ready" in the Status column. If the file format can't be recognized, then it shows "Unsupported" and such a file is ignored in the conversion queue. Number of simultaneous conversion processes - you can specify how many files can be converted simultaneously. Always stay on top of all windows - you can disable it (thus, the main window can stay in the background -- behind other windows), but if you enable it, the main window will be always visible even if you switch to another application (the only way to hide the window is to click on the standard minimize button). Disable context menu - in case you do not need the integration of Oxelon Media Converter with the windows explorer menu, you can quickly disable it here (sometimes you need to reboot the computer).